The moon light come true your little moon dream. As like you have your own moon, you can enjoy the beautiful lights everyday. Perfect to decorate your home, become more creative. 1.The best remote control distance for the remote control is 10 feet, obstacles will affect the control effect. 2.Touch switch can only change the color, and the remote control can change and adjust the brightness. 3.This moon light is a decorative light, please do not use it like a toy. Reliable Quality -- Safe 3D print moon lamp made by eco-friendly PLA materials, it is odorless and non-toxic, and adopting low voltage USB charging and energy efficient LED light bulb. 16 RGB Colors -- This moon light is dreamlike and creative decorative lights, can show 16 different colors. It will bring different experience to you. Remote and Touch Control -- Use the remote control you can easily to change the color or adjust brightness of the moon light. The round bottom mini touch switch also can adjust the moon color. 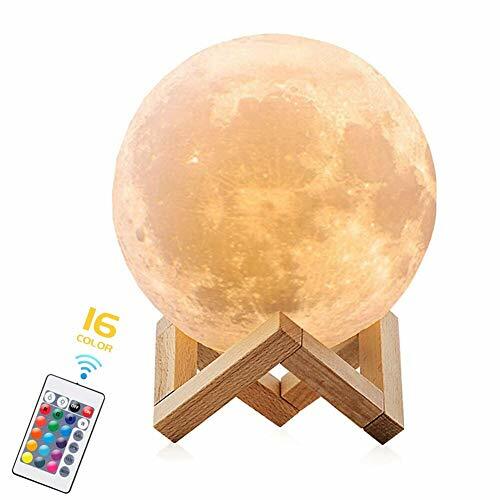 Lasting Working -- Moon Lamp build-in rechargeable battery, using standard USB charging port for PC, mobile devices etc. Only charging about 3 hours, it can use about 8-12 hours. Moon Design -- The moon night light is delicately crafted with 3D printing technology. Show the surface of the lunar moon vividly. If you have any questions about this product by LED Bright Life, contact us by completing and submitting the form below. If you are looking for a specif part number, please include it with your message.